Convert more online shoppers to customers with one tool. Create beautiful displays with easy to use targeting and triggers designed to get people to join your list and buy from your store. Learn more. Launch targeted pop ups and flyouts with exit intent and special discounts to close the sale before people go away. Learn more. Send automated abandoned cart emails, autoresponders, coupon reminders & welcome series that drive people back to your site to make a purchase. Learn more. Do you know the dirty secret of abandoned cart emails? Click here to see what you're missing. Just because you’re not a large corporation doesn’t mean you shouldn’t have world class marketing tools. Privy delivers results in minutes with a powerful drag & drop designer, a wide array of display types, intuitive triggers and targeting rules, and conversion-centric reporting. You’ll never need to get IT or a developer involved. Plus, you’ll get access to free, friendly chat and email support, no matter what plan you’re on. Use popups, spin to win campaigns or any of Privy's high converting display types to capture new contacts and grow your customer list. 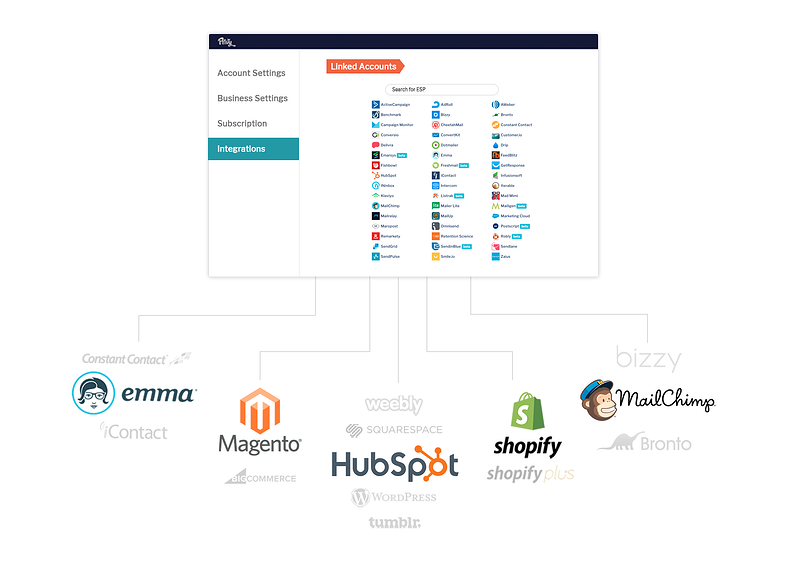 Privy integrates seamlessly with the top ecommerce platforms, website builders, email service providers, and more. From Shopify, Shopify Plus, BigCommerce, and Magento to Hubspot and Squarespace to Mailchimp, Constant Contact, Bronto, Retention Science and dozens more - Privy helps you get more from the software you’re already using. Over 200,000 small and medium sized businesses use Privy's highly targeted pop ups, banners, bars, flyouts, and email automation to rapidly grow their email lists and increase their online sales. see what people across the web are saying about using Privy. Start growing your customer list with Privy. START Free, no credit card required. Unlock all of Privy's features with our new and improved Growth plan. Learn more.